Every once in a while, you will find yourself thinking about restaurant business ideas. Sometimes ideas will come to you easily, but there are times when it may take some time to come up with them. This article is for the latter; listed below are a hundred restaurant promotion ideas that you can take to the bank. Check out which ones make the most sense for you and never be at a loss as to how to run a successful restaurant business ever again. Having a customer database can help keep track of your customer data. This includes their contact information and their buying habits. It is also helpful when it comes to streamlining marketing campaigns and in creating reports. Said reports may be of the daily variation, monthly, quarterly, or even annual. In organizing a successful food event, you draw attention to your restaurant. People will spread word of your business, which will generate in even more revenue for you. Bonus points if you happen to attract people with their own following, such as bloggers, vloggers, or influencers. A website is a must for any business these days. 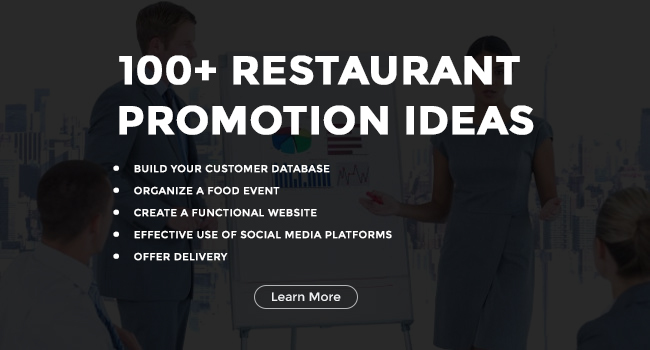 Through this, you can easily promote your restaurant in a myriad of ways. You may post announcements on your site, display your menu, provide links to your social media accounts, put special videos and picture, and so much more. Make your site a big part of your promotional efforts and keep it updated frequently. Just like your website, social media platforms are easy and cost free ways for you to promote your restaurant. Pick out the right platforms to get the ball rolling. Do your research and find out which platforms your target market is using the most. Be consistent with posts and do your best to communicate with your customers. Delivery services can be a fine way to promote your restaurant. Imagine a truck or a motorcycle with your logo on it, travelling to and fro for everyone to see. Not only would you be satisfying your customers with convenience, but you’d also be advertising the business in a way that’s easy to do and cheaper compared to other tactics. Promoting your brand will involve creating a powerful presence to present to your audience. One way to do this would be to advertise in places where many will see it. You can also make sure that your employees are present in important events so that they can take advantage of the best networking and promotional opportunities. Social media promotions are even more encouraged, due to the availability of it and its mass appeal. A blog about your restaurant’s dishes is an excellent way to draw customers in. Creating quality content is essential to keep readers glued to your site. Consistent posting is also necessary, so be as reliable as possible with those two areas. You can post your blog on your website and put out links on your social media accounts to reach as many people as you can. To keep things from getting too monotonous, you may want to provide your customers with special offers. This could be a seasonal thing or it could be tied with another event. If your offer is well received, you could see more traffic to your restaurant, with new customers looking forward to more special offers in the future. People want convenience and what better way to grant them that than by using online reservation tools. This can lead to customers being able to reserve seats some time before they even arrive at your restaurant, which eliminates the trouble of having to wait for a table to be available. Since it is online, they can do so at their leisure as well, which is something that should be well-received. If you can grab hold of celebrities, then you can bet that their fans will follow. It could even be any event and not just charities. Combining celebrities and good causes make for attractive events that any customer would love to hear about. You might even expect media coverage, depending on how well known the celebrity is, which can promote your restaurant like no other. Holidays are special to people because it frees them up to do things like visit their favorite restaurants. Therefore, it makes sense to try and come up with something special during those days. Certain dishes on discount is a fine idea, as are offering limited time foods as well. Take advantage of these days and you should see your customers leave your restaurant satisfied with what they’ve gotten. What better way to reward loyal and consistent customers than with their own special offers. There are multiple ways for you to do this. One, you could provide them with discounts on their next orders. Another would be to provide them with something free, like gifts or an additional item along with their next order. Get creative with how you do this and you can bet that word of your generosity will spread far. When you’re just about to open a restaurant, having select offers available then is a great way to start things off. Gauge interest in said offerings and see if it is something your customers would like to receive again at a later date. This can give birth to a slew of promotional ideas for the future whilst you benefit from it in the present. This is the act of sending commercial messages through email. In this act, you can send out advertisements to potential customers. You may also request business or solicit sales and donations through email marketing. The purpose of this is to create loyalty and awareness to your brand. Emails may be sent to purchased lead lists or perhaps to current customer databases. Although something of a minor tactic, offering free wifi can help keep your customers happy. From there, you can bet that word of mouth will lead to your customers’ friends learning about what you have and may try it out for themselves. This is particularly appealing to students or workers, who may need to stay connected as much as possible. With the accessibility and popularity of apps, what better way to promote your restaurant than by creating an app for it? Show what you’ve got to offer, among other things, upon the release of the app. Through this you can have a delivery service. Or you can use this for the online reservations. Your customers may even use this as a way for them to rate your services or provide you with feedback. Reviews can also be a great way to promote your business. Note that not only should you pay attention to the ones written by critics, but also to those provided by your regular customers as well. You can even ask for reviews and then post the best ones on your website as testimonials of sorts. As far as the negative ones go, you can use it to discover weak spots in your products or services, which can lead to major improvements down the line. Instagram is one of the most popular social media platforms in the world today. For businesses, it would be a no-brainer to advertise and promote their products and services on it. Through this, you can post pictures of your best dishes. You can cover special events and even announce them in advanced. Due to how widely used Instagram is, you can bet whatever market you’re targeting will also be using it. There are reasons why traditional advertising has yet to fade away. You can advertise locally through newspapers, posters, or radio. This won’t be cheap and many already prefer the use of newer and less expensive tactics. Still, there is merit in local advertising. Doing this together with more digital means can help you acquire a wider audience, accounting for various segments of your market. Show off your selection of food and drinks so that you can attract a broader audience. It could be just a partial advertisement, or you can display the entire thing. The former option may serve as a preview of sorts, which may be quite enticing in its own right. You can do this on your restaurant’s website, social media accounts, or even advertise this through traditional means. This is a clever and effective tactic that you can utilize every now and again to get people talking about your restaurant. Limited dishes will be seen as special amongst customers, so you can expect greater amounts of traffic in your restaurant during those occasions. This is even more true should those dishes become incredibly well-received by your customers. Demand for it may soar, which can only be good news. Having restaurant signage on the outside makes your restaurant look quite cool, which definitely helps make it more attractive. Through this promotional tactic, you can draw in certain crowds with ease. Depending on how you design it, signage can even attract the type of people that you may not even expect. Get creative with this and experiment; see what you get and compare results. There are multiple ways for you to involve your front of the house staff in the promotional efforts. One would be for them to simply excel at their jobs. Being quite pleasing and satisfactory to customers will already go a long way in establishing promotional efforts. Another way would be through staff being made to hand out pamphlets. Bringing in chef guests can be a good idea, especially if the guest is someone popular or mildly famous. It could be a blogger or a YouTuber, or even customers who are qualified to cook food professionally. Employing this tactic is one good way for you to be exposed on other channels that may not necessarily be aware of your business. It can even border on cross promotion. Getting involved in community events is an excellent way to draw attention to your restaurant. People can sample your food during said events and it doesn’t have to cost you a lot to promote. Some of these events may include charity concerts, sporting events, or certain sales. Having good food available during those times will make everything much more enjoyable and will provide you with good publicity. Themed parties in your restaurant is fun for a variety of reasons, and can be quite instrumental in bringing in various groups. For some, the obvious choice would be to host parties with themes based on seasons. Holidays may also work, with Halloween or Christmas-themed parties being among the more popular ones. Posting videos and pictures of said party on your social media accounts will also help promote your restaurant. A live band can do wonders for your restaurant’s popularity. Get a local musical act and you not only attract music lovers to your restaurant, but you also attract whatever fans and supporters they may have. This tactic lightens and brightens up the mood, which only serves to enhance your restaurant’s general ambience. Another idea you can use to bring in traffic and revenue to your restaurants would be contests. This encourages active participation on the part of your customers, but what will really stand out would be the rewards. It could be something like a discount coupon or perhaps a free meal, which could be intended for just one time or for a whole period, like a week or month. Forming a friendship with a local food blogger can lead to wonderful things. One thing they can definitely do is go to your restaurant, if they haven’t already, and try some dishes out. From there, they can review what you’ve prepared and post it online. Should the food blogger have a strong following, then it definitely means good things for you. There are multiple ways for you to engage in social paying. For one, you could devote your time to paying for promoted posts on social media. This can be done on platforms like Facebook and Instagram. Another way of looking at social paying would be to reach out to bloggers and provide them with free meals up to a certain period in exchange for exposure on their websites or social media accounts. It is a good idea to stay on top of current trends. In doing so, you can keep yourself on the forefront of your customers’ minds. You will be able to come up with ideas that directly match with that they are into or with what they are familiar with. This will also set you apart from competitors who may rely on more traditional promotional methods. A customer loyalty program can be a long-term solution for your promotional problems. Doing this will effectively reward customers for sticking with you, which makes it quite appealing to many. This will result in significant revenue gains and you can bet that the returns on your sales and marketing budget will be improved greatly as well. Being in front of your customers creates a distinctly positive impression that you can’t create in any other manner. It shows them just what kind of character you have and it will make them feel more at ease. Doing this on a daily basis will entrench you in their minds as someone approachable and trustworthy. By extension, they’ll feel similarly towards your business. No one wants to check out a restaurant that’s too familiar. People enjoy novelty, which is why maintaining a unique atmosphere can be a good promotional tactic in its own right. Cultivate this through a seldom-seen yet effective theme, excellent execution of service, magnificent options, and unwavering dedication to quality. Product combos are things that your customers will respond to very favorably. This is because said combos tend to be cheaper than ordering individual items. Another reason is because of how fitting the paired items can be. Combos can also have their own themes, such as for couples or for friends and family. These are all things that many would enjoy and want to be a part of. Costly items, by themselves, won’t be particularly appealing to your customers. That said, you may want to feature them prominently on your menu. Doing so may convince people that the expense is all worth it if they can see it for themselves. The aesthetics of it will no doubt attract those who may be having doubts, so feel free to place images as much as you’d like on the menu. Food delivery apps have become successful and quite popular over the last few years. The convenience is the main selling point; knowing that their favorite restaurants are available to them at a single click is enticing for most. Be smart and join those restaurants who are already partnered up with food delivery apps. In doing so, you’ll be putting yourself out there and pleasing customers in a brand new way. Keeping in line with more technological-based tactics, mobile ads can also be done for the promotion of your restaurant. There are several types of mobile ads for you to choose from: click-to-download, click-to-call, image texts and banner ads, and finally, push notifications. Select the one that makes the most sense to you and your overall marketing strategy. In case having actual facilities isn’t enough for you, there are always other ways to serve customers and promote yourself simultaneously. A food truck would be an excellent choice to have, since its mobile nature allows you to get around and cater towards people that may not always be able to go to your physical restaurant. Seeing a food truck bearing your brand’s message all around may also convince others to give you a chance. There are many customers out there that would prefer to know that the ingredients used for your dishes are made using local ingredients. What better way to stir up their pride than by doing just that? This can work as a promotional tactic because you can provide credit to your ingredient sources, who in turn may also credit you as one of their best customers. It’s a win – win scenario for you and the sources, and can only please customers of both. Partnerships with other business are not uncommon, even for restaurants. Before you do this, consider the ones you choose to partner with carefully. Ensure that your goals and vision for the future are the same or at least very similar. From there, cross promote each other’s products. You should see customers of both businesses come together to participate in such a momentous event. Since customers are your business’s lifeblood, then it makes sense to do your best to engage them. This is a worthwhile promotional tactic because customers want interaction so they can get and learn things of value. Doing so means developing emotional connections and eventually building them up into a community. Exclusive offers and content are also means for you to engage customers more. Show effort and it is guaranteed that your customers will reciprocate. Engaging in SEO is a great way to draw traffic to your website or social media accounts. Do this right and you should attract more potential customers to your business without too much trouble. Your marketing department may be responsible for this, or you can reach out to freelance SEO specialists for the job. Retargeting is an online advertising form that is designed to bring back visitors of your website. Those are the ones who haven’t converted during their first visit to online stores. By having these ads on Facebook, you have a good chance to find success since your customers are likely to spend a lot of time on the social media platform. Emails can help in further developing any positive relationships you may have with customers. When coming up with a newsletter, it is important to create content that will leave them wanting more. Quality is the key, as is consistency. Your customers will appreciate you for both, and business will be a lot better for it. A spot in the local newspaper is never a bad position to be in when it comes to promotional efforts. It may not be nearly as accessible as online promotion, but it can still be a significant source of exposure for your business. Doing this also means there’s a chance that those who aren’t as internet savvy will now get the chance to learn all about your restaurant. Having guest bloggers on your website can open the floodgates for fans of said guest. This can be a cross promotional thing that can pay off in a multitude of ways. Or you could do it the other way around and be a guest blogger on a prominent figure’s site. It is always good to look into different venues and avenues for new customers, so take advantage of such opportunities as they come to you. Cinemagraphs can be a unique and artistic way to promote your business. It doesn’t have to cost a lot and it can be sent to your customers in a variety of ways. You can attach it to emails, put it out on your Instagram or Facebook accounts, or even display it on screens within your restaurant. Communication is the key to any good relationship, and the one you have with your customers is no exception. Interaction that leads to greater engagement can be seen as a good promotional tactic already. Restaurants with a good reputation regarding customer service will definitely be valued by the masses. Only good things can come out of doing these things well. There may be some curiosities that your customers have with your restaurant. One of said curiosities may be regarding how you go about the process of making your dishes. If you peel back the curtain and show them how it is done, you’ll not only be satisfying their wants, but you’ll also show that you trust them enough to give a glimpse of how much effort goes into the day to day grind of your restaurant. A cooking class is an excellent way to teach others the skills needed to make all those delicious dishes. It is also a prime method to introduce to others just what you need to be in order to succeed in the restaurant business as a chef. By hosting a cooking class, you fulfill a large variety of needs and wants in a single go. Food challenges and their ensuing results can lead to moments with the potential to go viral. That’s enough reason to conduct them in the first place. However, you must also realize the publicity just having them can provide you and your restaurant. If not that, then people may join up for the prizes to be won. Examples that you may want to try would include speed challenges, quantity challenges, and spicy food consumption challenges. Don’t underestimate the value of Yelp as a marketing tool. Simply registering can be enough in some cases to increase business revenue. In order for you to leverage this, you can do things like maximizing your profile, keeping things fresh and responding to reviews. The use of Yelp deals are also great to maximize your chances of success. There are certain days that just stand out, so what better service is there than special hospitality. Doing so can show your customers just how much you care about them. In seeing what length you are willing to go for them, customers are bound to reciprocate with their own loyalty. Not to mention word of mouth regarding said hospitality will ensure your restaurant continued patronage. If your restaurant serves alcoholic beverages, then you may consider implementing a happy hour if you haven’t done so already. This is popular with a wide variety of people, particularly those who are looking to unwind after a long day at work. Sometimes even during work hours. Depending on how you do this, your restaurant could see a surge in traffic, revenue, and overall popularity. Some restaurants have a no sharing policy. This can be a good thing, depending on their reasons, but sometimes doing the exact opposite can also do wonders for business. Sharing of foods can be a wonderful breath of fresh air for those who love sharing what’s on their plate. Get with the program and see how well it affects your customers. You never know just what will work out if you don’t try. Receiving bad reviews is not something restaurant owners enjoy, but there is something to be gained from it. When confronted with flaws in your business, the smart thing to do would be to try and rectify what is being said. Seeing a restaurant learn from their mistakes can show customers that there is dedication involved in the mix, which is always a great thing when attempting to win them over. Being open handed with your recipes is a great way to win over customers, particularly those who also have a passion for cooking. You don’t need to give away everything; just some samples, so that those who will try to learn will still have an excuse to return to your restaurant. For the sharing of recipes, some people may want to put it on paper, but then there are others would may prefer to create a food preparation video. This could be a huge hit, especially if the food being prepared is among the favorites of your restaurant. Allowing it to be shared throughout social media is a good way to ensure that you’ll get lots of views. It may not seem like much, but it would definitely irk certain customers if they discover details about your restaurant online that are inaccurate. To avoid any embarrassment, make sure that everything is correct. The least you can do really is making sure that avoidable gaffes are, well, properly avoided. If you wanna know for sure how your restaurant comes across to your customers, then why not ask them yourself? Pulling them aside or going online to ask them for a rating can be a quick fix to any curiosity you may have. This isn’t something that will take up too much time; in fact, it can hardly last a minute, so this shouldn’t inconvenience anybody. Some would say that any publicity is good publicity. However, with the restaurant business, it would be best to stick to those that are actually just good. A compilation of this would do wonders for your image, which many will no doubt find appealing. As they say, accentuate the positives and hide the negatives. Advertise your social media accounts by sending people follow offers in the first place. This can be done in a myriad of ways. Some may choose to let people know through email; others may send word through SMS. You can even post it manually on a sign at your actual restaurant. Posting a poll on your social media accounts is a great way to get people to participate. This can help you get their opinion on certain dishes, what services they’d like to see from you, whether or not they like certain aspects of your business, and more. Polls are as much of a learning tool for you as it is a promotional tool for the benefit of your customers. Knowing your own restaurant and knowing others is the key to pulling this off. You should be aware of what sets you apart from your competitors. Do that and you can have a better chance at succeeding in marketing yourself. Knowledge of your strengths and weaknesses is also important since this is how you can derive your unique opportunities. Ensuring that your restaurant is a part of certain online lists will lead to prestige, credibility, and most importantly, the promotion that it deserves and needs. The lists you want to get into will include Yelp, Yahoo Local Listing, Bing, and Google. One good reason for you to join your local chamber of commerce is to enjoy the credibility it provides. Not only does such a move lead to more credibility, but you can also expect far more visibility among customers and fellow business owners. Advertising and sponsoring are also taken to the next level through chamber membership. This counts only when your restaurant is brand new. Having a grand opening is an excellent way to kick things off with a bang. Get everything in order and strive to have the best opening day possible. Spare no expenses and you should see all your hard work pay off when your customers start raving about what they just experienced. Media attention, in whatever form it might be in, can help promote your restaurant towards great heights. The key to doing this is to make sure that media is a priority. Offer news that would make waves and draw attention to your business. Be sure to talk to journalists and reach out to all the appropriate contacts that you may have. Press releases may be issued for this. As stated multiple times before in this article, sometimes excellence can be enough of a promotional tactic in its own right. Exemplary customer service is one way to go. You can expect customer responses to be quite positive and more than enough to provide good publicity for your business. Sample foods can help people decide if they want to go all the way with your restaurant. Said samples can be offered in your restaurant or you can have employees provide them somewhere else. Some may even decide to provide samples before the opening of the restaurant, thereby enticing people to become customers from the very beginning. User generated content can be defined as content that’s been created by unpaid contributors. They can even be your own customers. If that’s the case, then promoting these should be a priority. People love seeing their own contributions being paid attention to, so this ought to go a long way in building up customer loyalty. This is where you determine a website visitor’s location and deliver content that is most suitable to them. Such a clever advertising tactic deserves a lot of thought and attention. Be on the lookout for what country, state, zip code, or organization they belong to, as well as what their IP address and ISP are. Locally sourced food can be a point of pride for a lot of people. Offering your customers this can result in greater appreciation for your efforts towards them. This strategy can also be much cheaper than if you decide to go for foods and ingredients that are imported. Timing your tweets with special occasions or new releases is an excellent way to hit two birds with one stone. Promotional efforts such as these can be coordinated in order to achieve maximum benefits. You can schedule tweets ahead through the use of online tools such as HootSuite and SproutSocial. This works best during networking events. Fishbowl business card giveaways is where people reach into a bowl and randomly pick out business cards. This can lead to exciting opportunities that you may not otherwise get. You may even meet a future business partner or investor this way. Visiting other companies nearby can reap you several benefits. One, you can potentially form connections, which can be useful for future promotional efforts. Two, if they are competitors, then you can see for yourself what they’ve got going on, thus allowing you to prepare for whatever strategy they may be gearing for. Ensuring that your restaurant comes out on top in Google’s search results can be a complex feat. This would involve digital marketing efforts on your part, such as search engine optimization or Google AdWords. You’ll also need to make sure that your website or social media’s content are of a certain quality before you can even think of qualifying for this. Customers may not always want to think so hard on what to order. If you want to make things even easier for them, you can just share top menu recommendations. Even when they haven’t even entered your restaurant yet, simply seeing recommendations on their Facebook timelines could help convince them to give your restaurant a shot. This is where you are free to go crazy with how you announce things. You can create a video and post it on your restaurant’s social media. Perhaps you can come up with a brief radio piece or have employees show up at certain places to spread word of whatever it is that you’ve got up your sleeve. The spontaneousness of it all will no doubt catch people’s attention. What better way to promote your restaurant than with help from the local media. This is always an excellent move because it shows people that you are that big of a deal. Naturally, this will lead to the generation of interest in your business, which will drive an influx of customers. Facebook as a promotional tool can be a incredibly effective move if used right. Simple ways of doing so can involve like and share campaigns. This allows customers to be incredibly cooperative with your promotional tactics, especially since doing so can raise their individual status amongst their peers and family members. Always make it seem like your customers are getting the best of everything. To help paint the picture of quality, be sure to specify the quality of ingredients that you are using for your dishes. How you do this will be up to you. Servers may be instructed to highlight each item’s ingredients, or it could be specified directly in the menu for your customers to see. Traditional dishes can be phased out over time, usually in favor of newer and more in-demand food items. The passage of time and the strength of nostalgia should see renewed interest in said traditional dishes eventually. Once the time is right, you can campaign to bring it back, perhaps for just a limited time or maybe for good. Hungry customers do not equate to patient and happy people. Nobody wants to wait around too long for their orders, so guaranteeing speedy service is one way to keep things together. Acquiring a reputation for this through consistent delivery of your promise is always something you can take advantage of. Use it as a means to get more customers, thereby increasing your traffic and revenue. SMS discounts take two tactics — SMS marketing and discounts — and combine them into one neat package. This is an easy and effective way for you to take advantage on what texting has to offer as a promotional tool. Not only will this help you and your restaurant in increasing revenue, but you’ll also appeal more to your customers personally and gain or increase their loyalty. Supporting a cause shouldn’t be something to take lightly. Go for something that you truly believe in. The fact that your customers will notice this and become impressed with your integrity is purely a bonus effect. At the same time, there’s no denying the publicity your restaurant will get in supporting charities. Google AdWords is an advertising system run by Google itself where advertisers bid on keywords so that their clickable ads will appear in search results. Now, this may or may not work for you, considering the competitiveness of keyword bidding. Through proper and effective use, however, you can be that your restaurant can be thoroughly promoted in this manner. Although not as popular as Facebook or Twitter, a Google+ account can still be used to market and promote your restaurant. Setting this up is easy enough and pretty soon, you’ll be able to do there what you’ve been doing in other social media platforms. When you buy in bulk, you decrease the potential expenses that will come your way. Upselling, on the other hand, will ensure greater sales and revenue for you, making this a win-win combination. When it comes to your restaurant, the bulk buying will pertain to things like your ingredients. From there, it is up to your servers to upsell your menu items in the best ways possible. Exclusive products or services can be handled in a myriad of ways. For one, you could offer something so unique that people would see it as a defining selling point for your business. This can be difficult to pull off, but if you can do so, the promotional potential for it would be through the roof. While not a promotional tactic or idea per se, it must be said that there are opportunities even in the most unlikely places. Learning to find said opportunities is a skill that is not easily mastered, but if you do get the hang of it, you’ll find promoting to be a much easier endeavor. The first thing to work on would be not to disregard anything too quickly. Take a closer look and decide if something is worth pursuing or has a great enough value. When looking to promote your dishes, you may want to utilize feature-benefit selling. This tactic ensures that your customers realize what they have upon ordering certain items. Let them know what benefits are headed their way once they buy a specific food. Inform them of the features of a particular service. This basic marketing concept is usually ignored but can be greatly effective. Want to ensure that your customers check-in on Facebook upon entering your restaurant? Well, you can reward them for doing so. Some of those rewards can be through exclusive discounts. Perhaps a randomly selected customer can get a free meal out of it. Be creative with the incentives so people will have greater motivation to participate. Adaptability is a key element to success in business. Posting according to the weather can be a good idea since it provides you with unique opportunities to reach out to your audience in different ways. If it’s raining hard for a certain period, for example, then you can take the opportunity to promote some of your hotter meals. Alternatively, should there be a major drought or a heat wave, promoting your colder items would be a smart move. When you make a promise, it is your responsibility to live up to it and deliver. However, when you over-deliver on what is expected, you can also expect that your elated customers will gush about it to their own friends and family. In essence, your own excellence will serve as a promotional method in its own right. Satisfy your employees to the fullest and you build up a reputation that can potentially exceed many promotional tactics out there. One way you can do this is to create an environment that caters well to millennial employees. As you succeed in doing so, you can expect raving reviews from your staff, which does well for your public image. It is good to have the important people on your side when you seek to promote your restaurant. In this case, said important people will involve food bloggers and influencers. Invite them over for a free meal and they might just help you out with your endeavors. Specifically, they’ll promote your restaurant for you through their blogs or on their personal channels. Keeping your customers informed is something you can easily do through your social media accounts and on your website. Consistent updates show that your restaurant continues to thrive and that you care enough about your customers to let them know. You can even send these updates through text and email, provided that you have your customers’ contact information. The distribution of pamphlets is one thing you can do to promote your business. Having printed sales literature like this is still effective because it can save time for your potential customers, who can just take the material home and read it at their leisure. Another reason would be the credibility it provides you, since people tend to view those who can give out pamphlets and brochures as more legitimate. As you can see, there are a multitude of methods you can employ. In fact, there are even 50 ways social media could promote your restaurant business. Some of these strategies are easy enough, yet some can be time consuming and difficult. You don’t have to do all of them as it is guaranteed that just employing a few will already drastically affect your business. All it takes is some effort and patience.